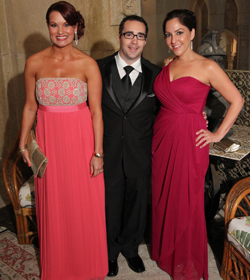 Sure they partied, but it was all healthy at the 57th annual Palm Beach Heart Ball. 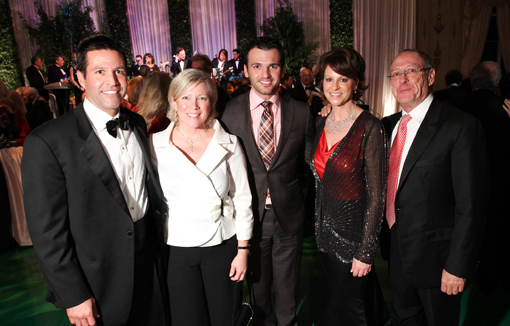 Above are Monte and Jennifer Young, Tony Dovolani, and Suzanne and Larry DeGeorge. PALM BEACH, FL – Who says you can’t have fun and be healthy, too? The Mar-a-Lago Club was the scene of the 57th annual Palm Beach Heart Ball, where guests enjoyed fabulous music and a nutritious dinner amid the striking floral design by Bruce Sutka. Inspired by the theme “Gardens for the Heart,” the decor included living centerpieces, remarkable ceiling-high trees, fresh fruits and vegetables and twinkling lights. The gala raised more than $600,000, which will go directly to fight heart disease and stroke. Angela Culveyhouse, Justin Hoysradt, Jennifer Hampton. Members of the Palm Beach Symphony performed during the cocktail reception, while channel 12’s Suzanne Boyd greeted the guests. Tony Dovolani, of TV’s “Dancing with the Stars,” twirled on the dance floor with delighted auction winners accompanied by the music of Alex Donner and his Orchestra. Paula Butler served as chairman of the gala, Patrick Park was honorary chairman and Burt Reynolds was honorary ambassador. Sponsors of the gala on Feb. 17, 2012, included Lawrence J. and Florence A. De George Charitable Trust; Patrick M. Park; The Rhoda and David Chase Family Foundation; The Richard and Helen Devos Foundation; Suzanne and Robert Tomsich; Janet and Mark Levy; Herme dé Wyman Miro; and Kathryn and Leo Vecellio. The Exclusive Spirits Sponsor was BACARDI® Rum, The Luxury Grand Benefactor was Van Cleef & Arpels and the Media Sponsor was The Palm Beacher. Gift bag sponsors were: Black River Caviar, BLACCK Altima Connoisseur Club Black Card, Cornelia, Dilmah Tea, Florida Crystals, Hippocrates, Palm Beach Medical, Terra Creta and Van Cleef & Arpels. The American Heart Association works to improve the cardiovascular health of all Americans by 20 percent while reducing deaths from cardiovascular disease and stroke by 20 percent by 2020. In addition, the association raises awareness of heart disease as the number one killer of women, with its Go Red For Women initiative. Kathryn Vecellio is the Founding Member of the Go Red for Women Founder’s Circle. For more information, visit www.GoRedForWomen.org.